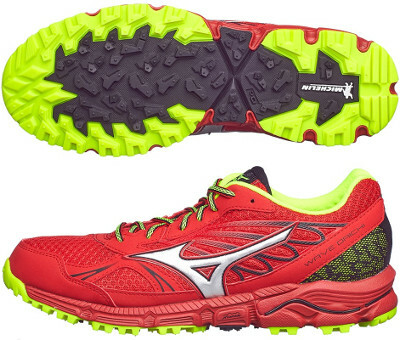 Mizuno Wave Daichi are neutral trail running shoes. The new Mizuno Wave Daichi is an all-round trail running shoe lighter than its bigger sibling Wave Mujin 3 replacing Wave Kazan. It is one of the new trail running collection from the japanese brand which features new outsoles with great grip and traction as a result of the partnership with well known tyre manufacturer Michelin. Compared to its theorical predecessor Wave Kazan 2 upper has been upgraded (in a similar way to premium Wave Paradox 3) with breathable AirMesh with stitched elements and fused overlay around midfoot for custom fit. Internal Dynamotion Fit™ strips remain wrapping the foot featuring a more secure transition and bigger toe bumper provides good protection against external elements like rocks and brush. Midsole in Wave Daichi introduces innovative U4icX™ layer on top (just below sockliner) for softer sock absorption and great comfort targeting heel strikers. Rest of midsole is made of full length AP+ and concave Wave™ in the rear side featuring reliable cushioning. Outsole has been redesigned following best practices from Michelin's off-road tyres (no Xtuds anymore) with specific rubber depending on the area for great traction and durability. Xta Groove in midfoot provides extra flexibility for uneven ground adaptation.